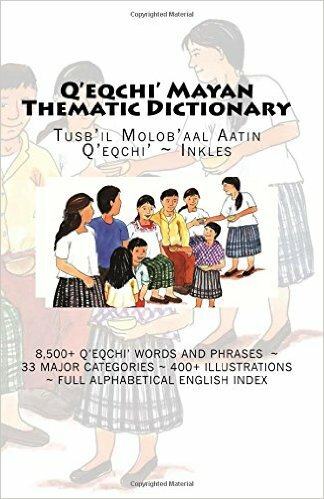 This dictionary builds upon the Q’eqchi’ Mayan Thematic Dictionary previously published from this database. In this version the arrangement of entries in the Q’eqchi’-to-English section is presented alphabetically rather than by theme. This approach offers advantages to native Q’eqchi’ speakers learning English in that one can more easily locate the Q’eqchi’ word in question and learn its English equivalent(s). 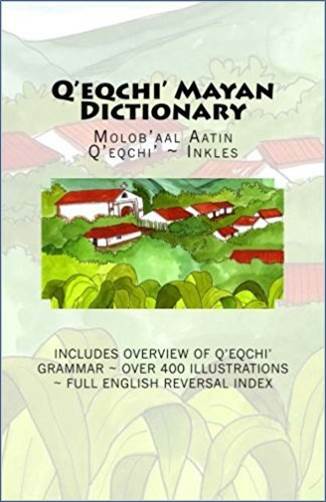 • Section I contains a simple introduction to Q’eqchi’ orthography and pronunciation for English speakers that are new to Q’eqchi’, as well as a comprehensive overview of Q’eqchi’ grammar that outlines the principal parts of speech and how they are formed into proper inflections, conjugations, and sentences. This grammar is new to this version of the dictionary and as far as I can tell it is the only Q’eqchi’ grammar written in English available in print. • Section II is an alphabetical list of Q’eqchi’ words followed by their parts of speech and English equivalent(s). Many of the entries are illustrated. This section also contains a number of new and updated entries not found in the first edition of the Q’eqchi’ Mayan Thematic Dictionary. • Section III is a reversal index that contains an alphabetical listing of the English words corresponding to all of the Q’eqchi’ entries in Section II. The dictionary also includes helpful notes on grammatical usage and evidence for borrowed words where possible. In addition, this version includes entries for many Q’eqchi’ place names and their etymologies and English meanings. While not yet complete, these entries are not found in the first edition of the Q’eqchi’ Mayan Thematic Dictionary.